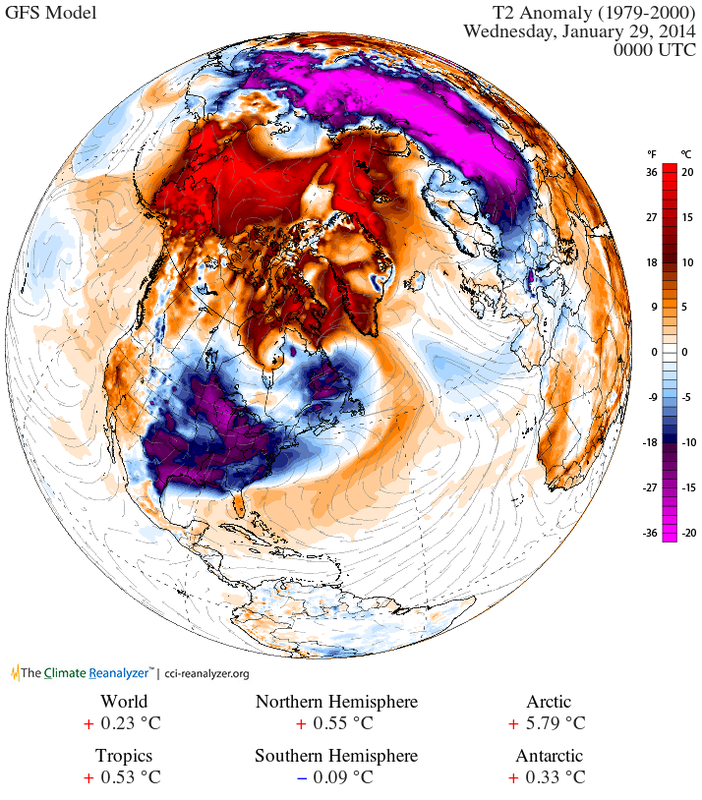 Its shows swathes of North America and northern Eurasia with winter temperatures up to 20 degrees Celcius (20C) below the average for this time of the year (deep purple), whilst much of the Arctic is up to 20C warmer than usual (bright red). If the Arctic is the northern hemisphere's refrigerator, then the freezer door has been opened wide, with frigid air draining into USA/Canada/Eurasia, and unusually warm air rushing into the Arctic. The reason is well understood and its climate-change-driven destabilisation of the Jet Stream. The Jet Stream is the river of high altitude air that works to separates Arctic weather from that of northern Europe, Russia and Canada, and which governs much northern hemisphere weather. Arctic summer sea-ice loss ice loss has added to ocean and atmospheric heat, pushing the Jet Stream into a more meandering, S-shape pattern, dragging down and stalling cold and wet conditions over Europe, and bringing extreme weather in its wake. There is evidence connecting sea-ice loss to the more severe and extreme weather patterns in Europe and North America, consistent with research from the US National Oceanic and Atmospheric Administration (NOAA). As Arctic melting and warming destabilize the jet stream and making it more "wavy", it allows frigid air to plunge farther south. As the jet stream waves become larger, they slow down or even stall at times, leading to a significant increase in so-called blocking events, such as the current stalled cold front. These cause extreme weather simply because they lead to unusually prolonged conditions of one type or another. Professor Jennifer Francis, of Rutgers Institute of Coastal and Marine Science, says the Arctic-driven changes to the Jet Stream allows “the cold air from the Arctic to plunge much further south. The pattern can be slow to change because the [southern] wave of the jet stream is getting bigger… so whatever weather you have now is going to stick around”. 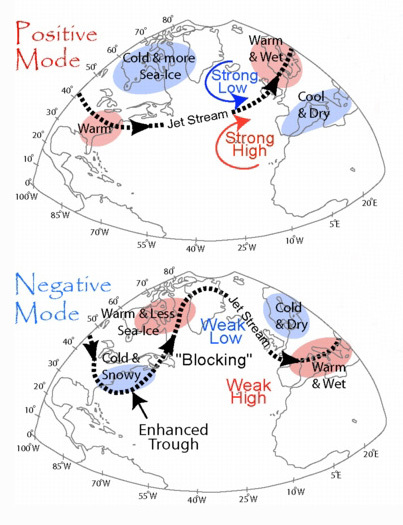 In March, new research found that “the severe loss of summertime Arctic sea ice — attributed to greenhouse warming — appears to enhance Northern Hemisphere jet stream meandering, intensify Arctic air mass invasions toward middle latitudes, and increase the frequency of atmospheric blocking events like the one that steered Hurricane Sandy west into the densely populated New York City area”. A recent study by Liu et al found that “the recent decline of Arctic sea ice has played a critical role in the recent cold and snowy winters” across the northern hemisphere, and Qiuhong Tang of the Chinese Academy of Sciences and colleagues from Beijing and the US report in Nature Climate Change that they have identified a link between declining snow and ice in the polar north, and catastrophic heat waves, droughts and floods in the mid-latitudes. They found a distinct set of patterns of circulation associated with the loss of snow and ice: the upper atmospheric winds in the north become weaker, and the jet stream shifts northwards, which means that weather systems become more stable. The longer a weather system stays in one location, the greater the probability that the conditions will become extreme.